Lost in the groundswell of Southridge's incredible offensive gifts is the reality that the Skyhawks are probably the best defensive team in the state. For all the highlight-reel plays, fast breaks and 3-point spectacles, the defensive end is where Southridge hangs its hat. 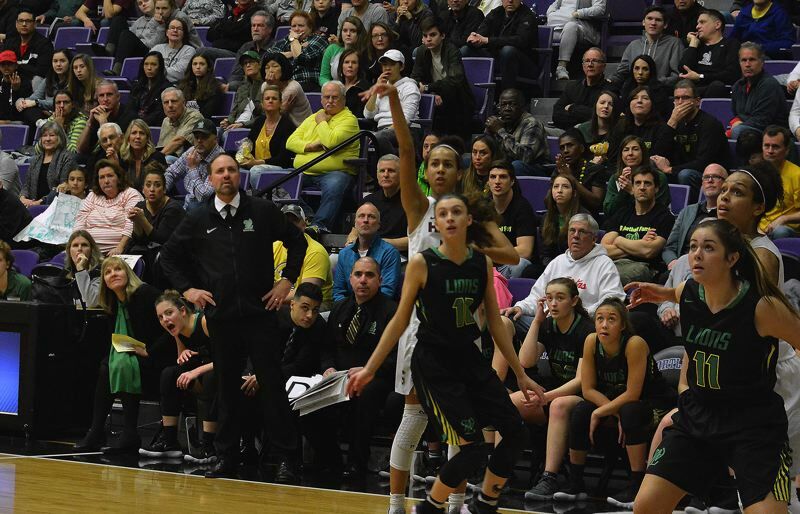 West Linn infiltrated Southridge's 2-3 zone for the first four minutes of the first quarter, getting out to a seven-point lead in the Class 6A state semifinals on Friday at the Chiles Center. From then on, however, the Skyhawks shut down the No. 4 Lions, swarming the perimeter with long arms, high hands, sliding feet, interconnected help and constant chatter. 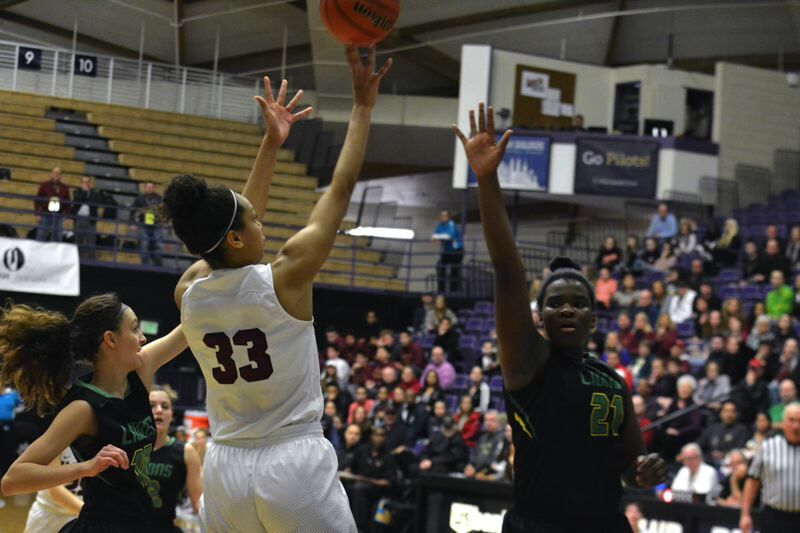 Southridge held West Linn scoreless for six minutes in the second quarter, scored 13 straight points and took a 15-point lead it never relinquished. The elongated drought helped Southridge lead by as many as 17 points in the second half en route to a decisive 54-38 win over West Linn to advance to the 6A title game for the second straight season. The No. 1 Skyhawks will take on No. 7 Benson at 3:15 p.m. Saturday. "Mainly, our defense is carrying us at this point," Southridge senior Natalie Hoff said. "We focused on not letting them get in the key and get easy shots. We take up a lot of space on the court. We talk a lot, move to the ball and anticipate passes. When people say 'Defense wins championships,' I never really thought about that quote. But now, defense is so important and it really showed." West Linn will look to respond in the third place game against No. 3 Beaverton at 1:30 p.m. on Saturday. "That one's in the past." West Linn senior guard Lexie Pritchard said of the defeat. "Now we're moving on to to the next game and we know we'll have a good opponent. I'm excited. It was a fun game to play in. It was a great experience. And just knowing that West Linn has never made it this far and getting to play here and getting to play against the ... top eight teams in the state is a blessing in itself and I'm happy I get to finish my high school career here." West Linn's roaring beginning stayed in step with what Southridge has run up against early in the playoffs. Canby and Clackamas came out ablaze against the Skyhawks in the second playoff round and quarterfinals and tried to ride those fiery beginnings for the rest of their games. The Lions and their mammoth student section brought the energy early, leading the reigning state champs 9-2 on a Makayla Long jumper and an Aaronette Vonleh layup off a pass from Pritchard. The Lions, like every team in the state, were looking to make history and send shock waves through the 6A classification. "Our goal was to throw the first punch, but I feel like (West Linn) did," Hoff said. "They came out with more energy than we did. But knowing everyone in the gym wants to see us lose is just motivation for us. We have a great crowd, too, and they helped us a lot. We needed that energy. The more energy we have, the better we do. It can't just come from our team, it has to come from coaches, crowd and fans." But Southridge has seen it all over the past two years, and when West Linn rolled in ready to tussle, Southridge switched into another gear, particularly on defense. 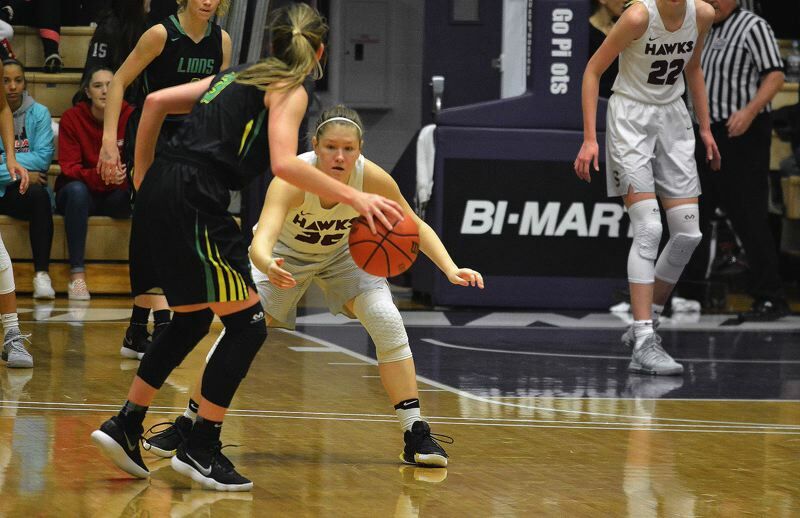 The Skyhawks' extended 2-3 zone was an unsolvable mix of size, with Hoff and Brink at the bottom of the defense, and length and quickness, with Maggie Freeman fanning out and McKelle Meek, Maya Hoff at the top. "Our length makes everything seem so unavailable that they can't really hit anybody who's open," Freeman said. "They almost have to make a perfect, pinpoint pass. We're sprinting all the time, talking and we know where everybody is. It helps that we're that close as a team on defense." West Linn's offense was pushed out beyond the 3-point line and went nearly seven minutes without scoring from the end of the first quarter until there was 1 minute, 12 seconds left in the second when Kennedi Byram banked home a short layup that made it 28-15. The Skyhawk defense led to open "threes" from Meek, Natalie Hoff and Maya Hoff, and an inside hoop from Brink. Maya Hoff's two free throws punctuated the game-swinging 13-0 run. "They play really well together," Pritchard said. "They have great chemistry. They talk really well. It was hard to get a shot off. I think they (play defense) really well with each team and they're always going 100 percent on defense. The first quarter, I thought we came out really strong and they kind of held their own, but then they came back doing what they do best." Meek and Maya Hoff harassed West Linn's guards with constant ball pressure. The other three Hawk defenders closed down passing lanes and shut off the high post and corners. "Honestly, if I was playing against our defense I'd be a little nervous," Freeman said with a smile. "Nothing looks open. You could take a picture from where the point guard sees our defense and our hands could be connected across the court. That's how long we are. We know we're not gonna win a game without defense." 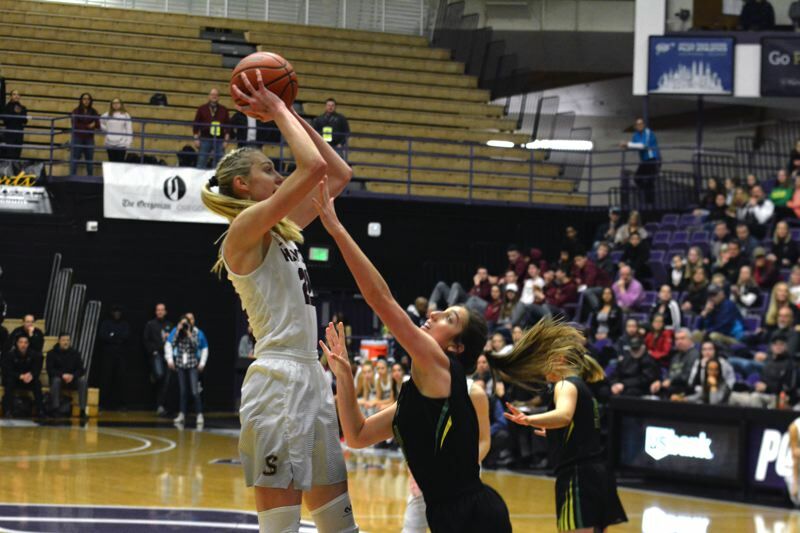 In the third quarter, Brink blocked Pritchard, putting the Lion guard on the Chiles Center deck as Southridge raced the other way for a Maya Hoff 3-pointer that extended its lead to 35-19 with 4:34 left. Southridge never led by less than 13 in the second half. "When we're working on defense, it helps us on the offensive side, too," Hoff said. "Us working hard at the end of the game made it easier. We didn't feel like we were catching up." Brink, still battling a gimpy left ankle, looked great all game with 16 points, 10 rebounds and five blocks. Her presence on both sides of the court was infectious. Maya Hoff had another stellar state tournament game with 11 points on 3 of 3 shooting. Natalie Hoff had nine points, three rebounds and two assists. Meek had a team-high three assists along with seven points. Freeman finished with nine points and a jarring block in the first half. "We had to play as hard as we could for as long as we could," Freeman said. "We were making the extra passes, hitting the open person, getting the best shot that we could on the court." After their fast start, West Linn's storm simply ran out of rain. Still, the Lions never rolled over and let the Skyhawks walk all over them. Long, a promising freshman playing in her first state tournament, scored a game-high 18 points to go along with five rebounds. Pritchard had eight points and six assists. "I feel like me, personally, I left it all on the court. I feel like my team left it all on the court," Long said. We were diving for balls, hustling and we really just played our hearts out. It just didn't go our way today. Hopefully, we will be ready for tomorrow. I think we'll be ready."